STEAM eggplant for about 4 minutes. 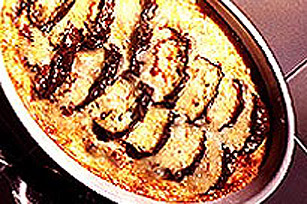 LAYER half of eggplant in a greased 9-inch (2.5L) baking dish. Combine cheese and rice and spoon evenly over eggplant. COMBINE salad dressing and eggs. Spoon half of the mixture over the rice. Top with remaining eggplant, herbs and tomatoes. Cover with remaining salad dressing mixture. Sprinkle with additional KRAFT 100% Parmesan Grated Cheese. BAKE at 325°F (160°C) for 40 minutes or until lightly golden and puffed. Serve immediately.